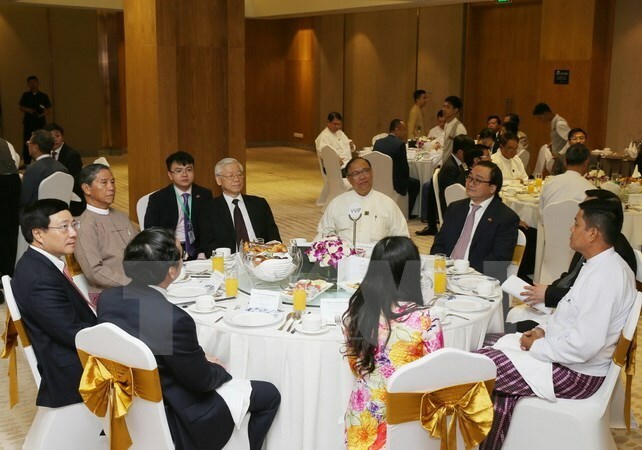 Yangon (VNA) – Party General Secretary Nguyen Phu Trong had a meeting with representatives of leading enterprises of Vietnam and Myanmar in Yangon on August 26 as part of his State visit to Myanmar. Addressing the event, Deputy Prime Minister and Foreign Minister Pham Binh Minh, who is accompanying the Party chief, highlighted the success of the Party General Secretary’s visit, including the establishment of a comprehensive cooperative partnership, thus creating new opportunities for bilateral cooperation, especially in economy, trade and investment. The Deputy PM noted that Vietnam has become the ninth largest trade partner and seventh biggest foreign investor of Myanmar, with 59 projects worth 1.42 billion USD in Myanmar. The direct air routes between the two countries have also help facilitate trade and tourism ties between the two sides. However, he pointed out that two-way trade has reached only 500 million USD, failing to match the two countries’ potential and strengths. Minh stressed that Vietnam is working hard to reform its administrative procedures to create optimal legal framework and infrastructure system for foreign investors, including those from Myanmar. He held that the newly-established partnership between the two countries provides a basis for the formation of effective collaboration mechanisms, thus boosting bilateral investment ties. Also on August 26, Party General Secretary Nguyen Phu Trong and Myanmar Vice President U Myint Swe cut the ribbon to inaugurate the headquarters of Telecom International Myanmar (MyTel) in Yangon, a joint venture of Vietnam’s Viettel Group and a Myanmar partner. After over 27 years of formation and development, the military-run Viettel Group has become a strong enterprise with great contributions to the Vietnamese economy. Its revenue in 2016 hit 11 billion USD with a profit of over 2 billion USD. The group is operating in 11 countries in three continents, covering a market of 320 million people, with annual revenue of over 1.5 billion USD and growth of over 20 percent per year, creating jobs for over 11,000 labourers. When officially inaugurated, MyTel will have the largest infrastructure system with almost 7,200 BTS covering 90 percent of the Myanmar population.